Actor/ writer/ producer Sylvester Stallone’s (Rocky, Rambo)cavalcade of action stars popped in on yet another August weekend with the same familiar structure: a group of affable, close mercenaries test the bounds of their association on a suicide mission taking them beyond their pay grade. After three franchise films in five years, the two sequels have ended up as an attempt at fine-tuning the above-noted premise demonstrated in the first film. While The Expendables 3 is the most action-packed, quickly-paced motion picture featuring the multi-faceted mercenaries, the atmosphere and tone have become predictable and unimaginative. Each new member of the crew gets a brief opportunity to shine, and it often comes off as nothing more than a forced, forgettable scene and a pathetic attempt to make each and everyone’s participation to be of paramount importance to the particular mission. Simply put: there’s no reason to care for what happens to these characters outside of their association in an attractive action sequence—and in that aspect, Australian director Patrick Hughes’ (Red Hill, upcoming American The Raid remake) newest film delivers. The plot rolls easily enough. Hughes opens on a rescue sequence featuring a helicopter chock full o’ Expendables on a mission to break a fellow member, Wesley Snipes’ (Brooklyn’s Finest¸ Major League) incarcerated, crazed Doc, out of captivity aboard a speeding train. Snipes receives the most screen time to create a character in the film and never misses a beat, clearly enjoying his role in the film. The opening sequence devotes itself as an introduction to Doc around the train and helicopter mayhem reminiscent of Mission: Impossible without the tunnel. 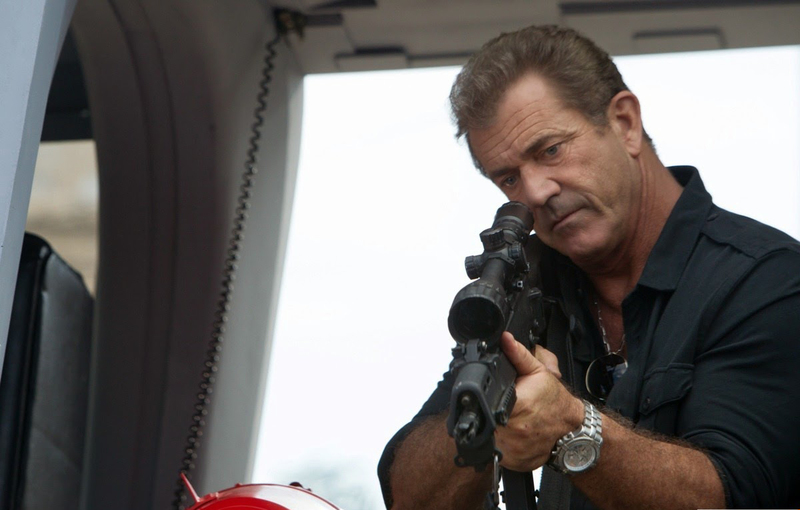 Another actor loving his participation in the film is Oscar-winner Mel Gibson (Kill the Gringo¸ Braveheart) as the villain of the piece, the appropriately-named Conrad Stonebanks. Gibson hits each tense mark to become the chilling, cold-hearted killer he has to be for each of his scenes to have a sense of dynamic. The acclaimed director has served villain duties of late with Machete Kills and now The Expendables 3. Stonebanks figures into the film not only as a villain, but as a founding member of the Expendables alongside Stallone’s Barney Ross with a score to settle. Veteran performers Antonio Banderas (The Mask of Zorro, Original Sin) and Kelsey Grammer (Transformers: Age of Extinction, X-Men: The Last Stand) have fun playing their limited roles as well as allies of Stallone and the Expendables. It’s a rare treat to see an ensemble cast feed off each other and delight in playing their characters—however limited on screen—throughout the course of an entire film. Harrison Ford even pops in to help Stallone burn former franchise cast member Bruce Willis. Unfortunately, the rest of the cast merely collects their paycheck as the newer, younger Expendables (welterweight boxer Victor Ortiz, MMA fighter Ronda Rousey, and actors Glen Powell & Kellan Lutz) recruited for the sole purpose of nabbing Stonebanks never get to see their characters explored beyond each of their respective introduction scene. After Stallone finishes assembling his new group, the second act plays out almost exactly like the second act of Mission: Impossible III where the villain is detained during a daring mission, followed by the immediate retrieval of the villain by his goons. The other, familiar Expendables never get a shot to flesh out their characters as Jason Statham (The Transporter, Crank), Dolph Lundgren (Rocky IV, Universal Soldier), Terry Crews (Draft Day, “Brooklyn Nine-Nine”), Randy Couture (Redbelt, Hijacked), and Arnold Schwarzenegger sit on the back burner for most of the picture. Although The Expendables 3 never enters new territory, the elated actors make it an enjoyable ride. The familiar faces hardly get room to peek their noses around the corner in favor of new franchise members. Nothing new is said or offered in yet another Hollywood action blockbuster; however the picture manages to unfold in an entertaining fashion with one action sequence following another. The two-hour runtime could have been significantly reduced, but how else was director Patrick Hughes supposed to make every single cast member feel like a necessary contributor?